Anisotropic Injection Molded Magnets – The common molding technics of anisotropic ndfeb magnet are injection molding and compression molding. Two major application samples of anisotropic ndfeb magnet are sensor magnet and expansion valve. 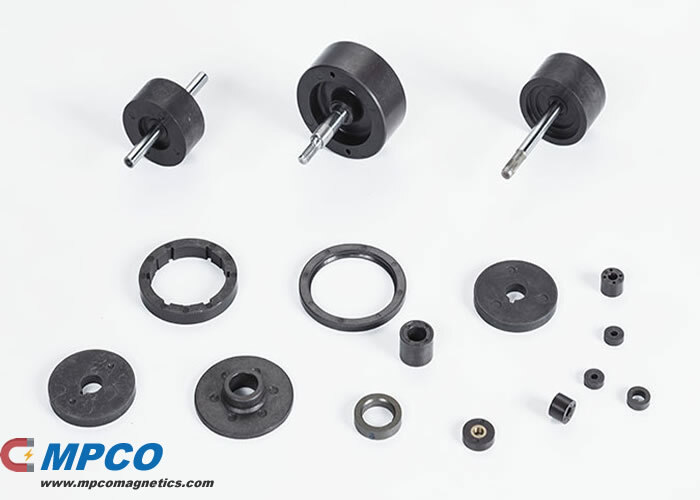 Injection Molded Neodymium magnets are made by permanent magnetic powder, Neodymium powder, and thermoplastic matrix material (PA 6, PA 12, PPS). Magnetic material could directly insert in or against the shaft and other components, which eliminates the additional assembly process. In addition, the thermostability of this type magnet is affected by its binder. With the PPS type, the operating temperature could achieve as high as 180℃. The advantages of injection molded magnet derive from the fact that it not only allows the thin-wall and intricate design, but also it can be designed in a multipolar or complex magnetization. The manufacturing process of injection molding, connecting the magnetic material to shaft and other components directly, eliminates additional assembly process and saves the cost. Conforming dimensionally to the mold cavity gives them the advantage of close tolerance, which is widely used in automatic equipment, stepping motors, Brushless motors, DC to DC Air conditioner motors, cooling fan motors, meters, automotive sensor, and high end household appliance.